So you want to loose weight ? You have tried many things, and it had not worked ? Infact, everything you have tried, it seemed, that you have gained more weight. Here are some concepts, and 7 steps , which we teach in our Wellness Program, which will help you, to have a balanced weight. Wellness has an important link with balance weight. How close you are to the state of balanced weight can be figured out by Body Mass Index [BMI]. BMI is a person’s weight in kilograms, divided by the square of height, in meters. BMI helps us to understand whether our weight is balanced or not ? Heavy weight can be a blow to your self esteem as more extra weight you gain, more you feel bad about yourself. Not only that, it can have a adverse effect on your movement. Your body becomes heavy, and, it’s impossible to move flexibly, and to do certain things, which you want to do .There are many experts who says that more you gain weight , more you are prone to many kinds of diseases . Many of them say it right. So , it’s very important to have a balanced weight for living well . Step 1 : Reassure yourself that you want to Check Weight. In our Wellness Program, we teach a very important concept called “Wellness Mind”. Many people are not only having a bystander attitude for social issues. They also have a bystander attitude, on their health too. Many excuses are brought , for not having a strong intent, for a healthy body. Our mind is a powerful instrument to transform ourselves, however in its default mode; it is always engaged in either daydreaming or mental chatter. That’s why it’s important to stop the mental chatter, and day dreams, and reassure yourself, that you want to check weight. Mindfulness is something, which matters for each one of us, to live well. Infact, living well, starts with the practise of mindfulness. That is why, it is so important to stop the chatter of the mind, and day dreaming, and start focusing on losing weight. It is when you become mindful, about having a balance weight, you start observing, what are the lifestyle habits , which is making you to gain weight. Most our workshop participant, complain that they start gaining weight, when they feel fear and need for protection. Psychologists have confirmed that there is an inter-relation, between the growth of weight, and increase of stress level. So, in Wellness Program, we conduct a stress survey, to give an accurate understanding of your stress level . This helps to focus your mind on issues, which affects the stress level, in your life , and how you can deal with them. Normally, we have found that there are many, who want a quick fix solution to their obesity problems. So they take medication and nutrition supplement to fix their obesity problems. However, this solutions are only short term solution for obesity, and they work, only when you take them. Once you stop this medication and nutrition supplement, you once again start gaining weight. Instead of that, if you take a resolution of ‘eating right’ in mind , that will start bringing a lot of changes in a ositive direction. In our Wellness Program , we always suggest people to take a balanced diet between different types of food – Sattwic (Pure Vegetarian Food ) , Rajasic ( hot, spicy non vegetarian food ), Tamasic ( stale and rotten food) . You should always avoid Tamasic food and take a combination of Sattwic and Rajasic according to the nature of work, whether it is a knowledge work, or an manual labour. In our Wellness Program , we teach a combination of Surya Yoga , Surya Shakti Kriya and Surya dhyana, which we refer as Wellness Yoga , as it helps to do both the physical work , breath work and the mental work , in order to keep you well , and control the weight. Wisdom points are set of condensed knowledge statement, which helps to do the lifestyle modification, which is required for keeping our weight balanced by practising Mindfulness. Mindfulness is the key teaching of wellness program, which helps you to bring the mind in the moment. Better mindfulness, helps us to understand both the emotional factors along with eating, and lifestyle habits, which is forcing you to gain weight. It’s the most easy and simple step in all the seven steps, to check your weight . 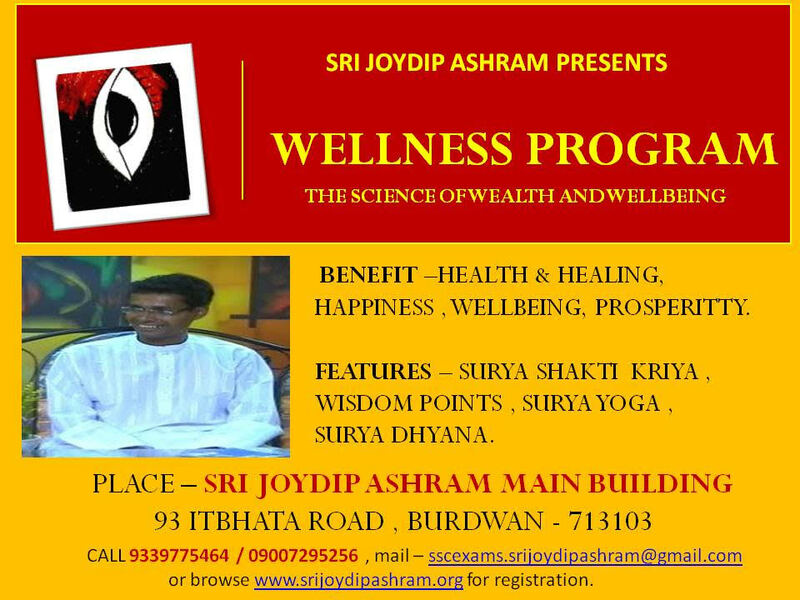 We have Wellness programs, in all our existing Sri Joydip Ashram centres, most of the weeks in a year, and we plan to make it every week, starting from Wednesday of every week, and ending at Sunday. This weekly 10 hour investment of daily 2 hours for 5 days in a week, can change the course of wellbeing, for your life, by controlling your weight. Just send a mail to sscexams.srijoydipashram@gmail.com and register yourself, to get the exact location and the timings of a week. Try to do it in advance that you get your reservation of seat . Seats are distributed in first come first serve basis.